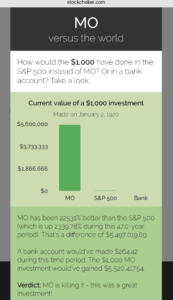 Have you ever wondered how much a stock would be worth today if you had bought some in the past? 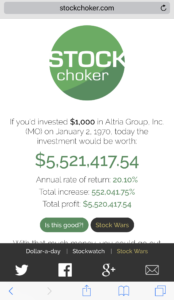 You can now with this easy tool, Stock Chocker. Man, I love the Internet! It has data that goes back to 1/2/1970, if the stock was around then. Check it out. It’s a lot fun. It’s also the website I use to figure out returns from a certain date until now like it did in this post. It’s never too late. Think about your future, your kids’ future, you’re grandkids’ future. This entry was posted in Investing, Our Story, Stocks. Bookmark the permalink. Thanks Alex! Glad you liked it and found it helpful. Thanks for reading and the nice comment Jason!